for digital signage via HTML5. rooms are not in use. 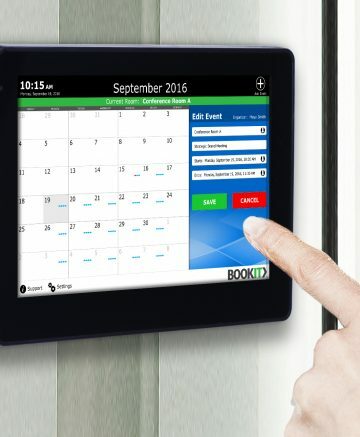 System Includes: 7” POE touch panel device, simple wall mounting system (brackets included), BookIT Room Scheduling Software, power adapter (when you don’t want to use POE) and a quick start guide. Want to know what is happening in a meeting room? Color-coded room status of red, gold and green lets you immediately know the availability of a room. Click on the calendar button to see a list of meetings in the room the sign is assigned to. The list is scrollable so you can see out to the end of the booking period allowed in Exchange or Google. BookIT panels can now be used for digital signage via HTML5. Display useful information such as corporate messaging on BookIT panels when meeting rooms are not in use. Allows booking of a room without logging in. Events are entered in the room calendar, only so the room is seen as occupied. Your meeting’s over early? Why not make it available for others by simply releasing the room on the BookIT touch panel display. The end to your meeting will automatically be updated for others to see. You can set how far ahead the calendar will look when using the Add dialog or calendar screens. This will result in faster screen loading. Did your meeting run over? You can extend the meeting on the BookIT touch panel display. If there is a conflict with an upcoming meeting, you can easily find an alternative meeting room. Need to schedule a meeting from the display? Select “Add”, enter your credentials and you can now schedule a meeting in any available room at any available time. Realize that you have a meeting scheduled and you need to cancel it? It’s easy to delete it from your phone, your computer or at the BookIT display. Only the meeting organizer can delete a meeting. Mark a meeting as private in Exchange or G Suite and show an alternate room title on the BookIT screen. The organizer name can also be displayed or hidden. A suite of room analytics is now available via the BookIT Device Management portal. First one to your meeting? Check-In! If nobody checks into the room within the configured amount of time, the room will automatically release for others to use. This feature can be enabled, disabled or configured at any time by the administrator. Have a technical issue with a projector or a display? Just touch ”Support” and send a predefined message to summon your internal technical support team to the room. If a user goes to a display to book a room and it is occupied, the Alternate Room Finder will enable the user to find either the closest or best-suited room and book it immediately. You can easily change backgrounds and include your customer’s logo on the display.